This is going to be the experience of a lifetime, so if you need more info on the wine competition and the public tasting, we’ve got you covered. We’ll be breaking down exactly what’s going on, and what you need to do to get into the Fort Mason Center to enjoy that delicious wine. Wine Competition? Public Tasting? What in the World Is Going on Here? Excellent question. Though branded with the San Francisco Chronicle Wine Competition name, the Public Tasting is actually a separate event at a different venue. The competition, the 36th annual overall and 19th with the San Francisco Chronicle name, is not open to the public, but we’ll touch more on that later. Right now, let’s address the wine tasting that you can attend. 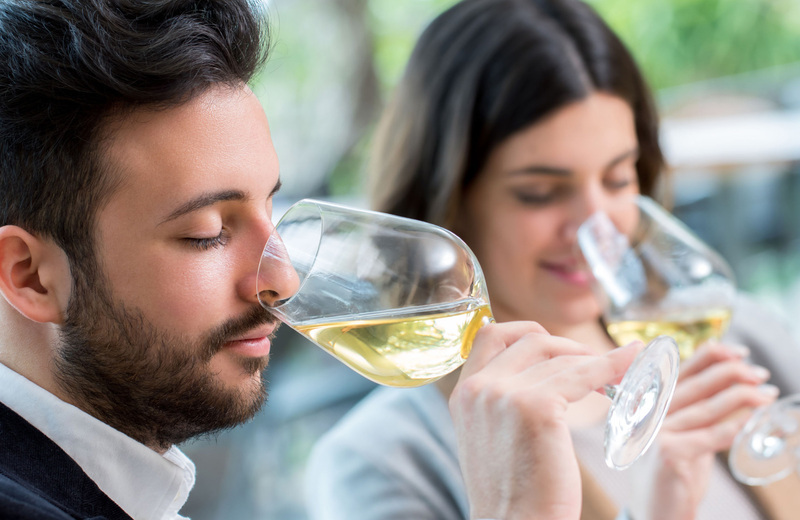 On the day of the Wine Competition’s grand tasting (February 16th), this sister event will give the public a chance to sample some of the same wines, of which there are more than 7,100 entries. They’ll cover the gamut of various wine styles, so to help you navigate, the event sponsors have put together this helpful glossary to help you keep all of that varied wine terminology straight. Sonoma Creamery — Deliciously addictive baked cheese snacks. Kite Hill — Artisan almond milk foods, including yogurts, cheese and pastas. Kevita Sparkling Water — Pure organic beverages that support you to your highest potential. Urban Foods — Making snack time healthy with actual real ingredients. Chirps Chips — Delicious soy, grain and gluten free snacks made from high protein cricket flour. Lark Ellen Farm — Handcrafted, organic, gluten & grain free foods that your body will love. Salty Sweet — A dangerously delicious cookie eating experience. Marlo’s Bakeshop — Wholesome indulgences to satisfy the soul. Cypress Grove — Award winning artisan cheese from Arcata. Whisk on Wheels — Delicious gourmet burgers, fries and more. El Tonayense Taco Truck — Authentic, award winning Mexican food and salsas. As for how to get in on the action, you’ll just need to purchase your tickets and show up to the Festival Pavilion at the Fort Mason Center at 1:00PM on Saturday, February 16th. The tickets are currently running at $70.00, and you can snag those directly from the Fort Mason Box Office webpage. Feel free to also take a look at photos from last year’s public tasting to get an idea of what’s in store. If 2019 is anything like its predecessor, this should be a fun time for everyone involved. Now, just because the actual judgine isn’t open to the public, that doesn’t mean you can’t follow along or stay informed about the results. Those will be available on SFGate and on the SFC Wine Judging page as soon as they are available. Also, part of the wine judging takes place at the Cloverdale Citrus Fair (which is also going on President’s Day Weekend). That’s also a closed event, but the Citrus Fair itself is not. Since it’s taking place the 15th, 16th, 17th, and 18th, you could conceivably attend the Public Tasting on the 16th, head to the Citrus Fair on one of those other days, and double your President’s Day Weekend excitement. What, exactly, is there to do at the Citrus Fair? Plenty, and the diversity of the activities makes it a great time for all ages. You might consider heading to the Carnival, for instance, which will feature all manner of fun rides and attractions for children and adults alike. Coasters, merry-go-rounds, tilt-a-whirls — you name it, you can enjoy it here. There will be exhibits to check out across the fairgrounds, and if you’re keen on checking out a contest that isn’t wine-related, the Citrus Fair has plenty of those for you to check out. The desert contests, for instance, will be testing bakers abilities at crafting different treats, while the orange juicing contest will let you pit your skills against other fair goers to see who can make the best juice (no pre-entry required). There’s going to be a cabaret, embodying the happening style of a 1920s speakeasy, a talent show, showing off the skill of both youngsters and adults alike, and even a parade that will take the streets by storm with marching bands and floats galore. Suffice to say, this will be an excellent way to pad out the weekend, and its part of a growing body of evidence that no matter what your interests, there’s always a way to satisfy them here in the Bay Area, whether those interests are wine-focused or not. Be sure to keep track of everything that will be going on with the Wine Competition, Public Tasting, and all related events by keeping an eye on the Wine Judging main page, and following the SF Chronicle Wine Competition on Facebook, Twitter, and Instagram. Above all else, be sure to have a great time when you attend the Public Tasting, or with whatever you decide to do come February 16th! Being right in action of the East Bay, the Vintage Apartments make for the perfect jumping off point for all sorts of Bay Area adventures. Regardless of where you decide to go, however, you’ll find that these apartments are the perfect place to come home to, what with their spacious residences and perfectly designed comforts and conveniences. Learn more about what’s in store for you here, and consider Vintage your first option for a beautiful life in the East Bay.